ITIL is part of a suite of best-practice publications for IT service management (ITSM). ITIL provides guidance to service providers on the provision of quality IT services, and on the processes, functions and other capabilities needed to support them. ITIL is not a prescriptive standard that must be followed; it is guidance to be used to create value. Organizations are encouraged to adopt ITIL best practices and to adapt them to work in their specific environments in ways that meet their needs. ITIL is the most widely recognized framework for ITSM in the world. In the 30 years since it was created, ITIL has evolved and changed its breadth and depth as technologies and business practices have developed. In 2007, the second major refresh of ITIL known as ITIL v3 was published in response to significant advancements in technology and emerging challenges for IT service providers. New models and architectures such as outsourcing, shared services, utility computing, cloud computing, virtualization, web services and mobile commerce have become widespread within IT. The process-based approach of ITIL was augmented with the service lifecycle to address these additional service management challenges. In 2011, ITIL v3 is further refreshed. This version is referred as ITIL 2011 or ITIL v3. ITIL v3 is replaced by ITIL 4 in 2019. *ITIL is not intended for Compliance or Maturity Assessment. There are third party providers who can do assessment for self-improvement. If the organisation needs a standard assessment, they need to consider ISO/IEC 20000 or CMMI-SVC. Value creation begins at Service Strategy with understanding organizational objectives and customer needs. Every organizational asset including people, processes and products should support the strategy. ITIL Service Strategy (this publication) provides guidance on how to view service management not only as an organizational capability but as a strategic asset. It describes the principles underpinning the practice of service management which are useful for developing service management policies, guidelines and processes across the ITIL service lifecycle. Topics covered in ITIL Service Strategy include the development of market spaces, characteristics of internal and external provider types, service assets, the service portfolio and implementation of strategy through the service lifecycle. Business relationship management, demand management, financial management, organizational development and strategic risks are among the other major topics. Organizations should use ITIL Service Strategy to set objectives and expectations of performance towards serving customers and market spaces, and to identify, select and prioritize opportunities. Service strategy is about ensuring that organizations are in a position to handle the costs and risks associated with their service portfolios, and are set up not just for operational effectiveness but for distinctive performance. Organizations already practising ITIL can use ITIL Service Strategy to guide a strategic review of their ITIL-based service management capabilities and to improve the alignment between those capabilities and their business strategies. ITIL Service Strategy will encourage readers to stop and think about why something is to be done before thinking of how. For services to provide true value to the business, they must be designed with the business objectives in mind. Design encompasses the whole IT organization, for it is the organization as a whole that delivers and supports the services. Service design is the stage in the lifecycle that turns a service strategy into a plan for delivering the business objectives. ITIL Service Design provides guidance for the design and development of services and service management practices. It covers design principles and methods for converting strategic objectives into portfolios of services and service assets. The scope of ITIL Service Design is not limited to new services. It includes the changes and improvements necessary to increase or maintain value to customers over the lifecycle of services, the continuity of services, achievement of service levels, and conformance to standards and regulations. It guides organizations on how to develop design capabilities for service management. Other topics in ITIL Service Design include design coordination, service catalogue management, service level management, availability management, capacity management, IT service continuity management, information security management and supplier management. ITIL Service Transition provides guidance for the development and improvement of capabilities for introducing new and changed services into supported environments. It describes how to transition an organization from one state to another while controlling risk and supporting organizational knowledge for decision support. It ensures that the value(s) identified in the service strategy, and encoded in service design, are effectively transitioned so that they can be realized in service operation. ITIL Service Transition describes best practice in transition planning and support, change management, service asset and configuration management, release and deployment management, service validation and testing, change evaluation and knowledge management. It provides guidance on managing the complexity related to changes to services and service management processes, preventing undesired consequences while allowing for innovation. ITIL Service Transition also introduces the service knowledge management system, which can support organizational learning and help to improve the overall efficiency and effectiveness of all stages of the service lifecycle. This will enable people to benefit from the knowledge and experience of others, support informed decision-making, and improve the management of services. ITIL Service Operation describes best practice for managing services in supported environments. It includes guidance on achieving effectiveness and efficiency in the delivery and support of services to ensure value for the customer, the users and the service provider. Strategic objectives are ultimately realized through service operation, therefore making it a critical capability. 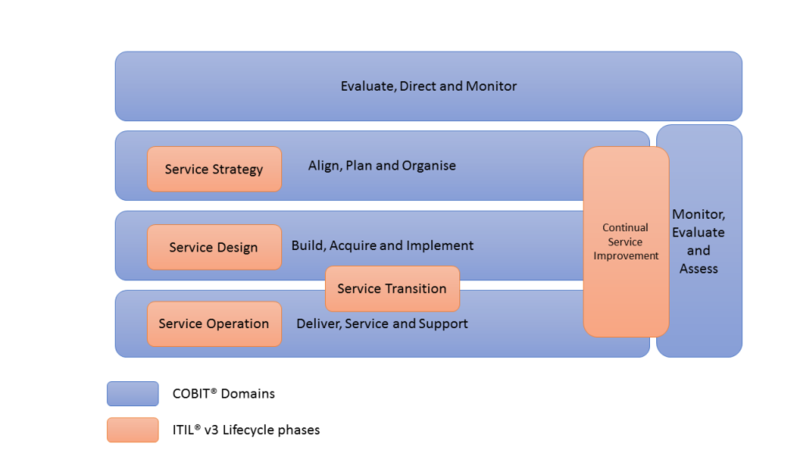 ITIL Service Operation provides guidance on how to maintain stability in service operation, allowing for changes in design, scale, scope and service levels. Organizations are provided with detailed process guidelines, methods and tools for use in two major control perspectives: reactive and proactive. Managers and practitioners are provided with knowledge allowing them to make better decisions in areas such as managing the availability of services, controlling demand, optimizing capacity utilization, scheduling of operations, and avoiding or resolving service incidents and managing problems. New models and architectures such as shared services, utility computing, web services and mobile commerce to support service operation are described. Other topics in ITIL Service Operation include event management, incident management, request fulfilment, problem management and access management processes; as well as the service desk, technical management, IT operations management and application management functions. ITIL Continual Service Improvement provides guidance on creating and maintaining value for customers through better strategy, design, transition and operation of services. It combines principles, practices and methods from quality management, change management and capability improvement. ITIL Continual Service Improvement describes best practice for achieving incremental and large-scale improvements in service quality, operational efficiency and business continuity, and for ensuring that the service portfolio continues to be aligned to business needs. Guidance is provided for linking improvement efforts and outcomes with service strategy, design, transition and operation. A closed loop feedback system, based on the Plan-Do-Check-Act (PDCA) cycle, is established. Feedback from any stage of the service life cycle can be used to identify improvement opportunities for any other stage of the life cycle. ITIL has a very good tool support. Please refer ITIL tools page (TBD). There are multiple skills needed to master ITIL. Please refer to individual processes that map to specific SFIA skills.